Singer: won't play it in seven flats. American Legion Bandleader: We don't know how to play in seven flats. We're not musicians. Singer: You don't have to tell me. A tip of the hat to the other commentors of this film. Their comments are enlightened and do justice to a real work of art. Here is my small contribution. 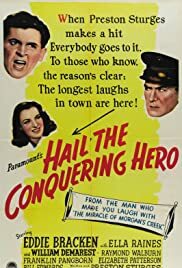 Eddie Bracken does a wonderful job as the meek, pitiful "hero", who just wants to go home. (The word that comes to mind is sanctuary. More than a place, it's a goal and ultimate need.) Home, back to his town, his mother, and his girl. William Demarest, as the sergeant, shines. He gives a laudable performance. Or is it just him? His "bark" in this film is very reminiscent of another famous role of his, that of the "salty" Uncle Charley on the long running TV sitcom, "My 3 Sons". The town is a delight. It is a typical small town of 50 years ago (or what we expect one to be). It's a warm friendly place with people you can count on. In typical small town American tradition, the truth is triumphant, everyone pulls together, and a tearful, happy ending is assured. I'm sure that if you close your eyes you'll be able to picture this place in your mind's eye.